Supporting IntelÂ® Core(TM) i7/i5/i3 and CeleronÂ® mobile CPUs with FCPGA 988 socket, industrial-grade AIMB-272 leverages Intel QM67/HM65 PCH chipset, provides up to 6 MB L2 cache, and features dual channel DDR3 1066/1333 SDRAM up to 8 GB. SATA RAID 0/1/5/10 capabilities ensure reliable storage and system protection for network-intensive applications, while PECI 3.0 support enables CPU turbo power mode control. 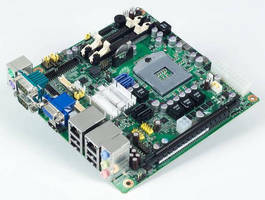 Board also provides diverse drivers, APIs, I/O, and connectivity options. Intel® QM67/HM65 PCH chipset supports Intel® Core(TM)i7/i5/i3 and Intel® Celeron® up to 6MB L2 cache. Founded in 1983, Advantech is a leader in providing trusted, innovative products, services, and solutions. Advantech offers comprehensive system integration, hardware, software, customer-centric design services, embedded systems, automation products, and global logistics support. We cooperate closely with our partners to help provide complete solutions for a wide array of applications across a diverse range of industries. Our mission is to enable an intelligent planet with Automation and Embedded Computing products and solutions that empower the development of smarter working and living. With Advantech, there is no limit to the applications and innovations our products make possible. (Corporate Website: www.advantech.com). Advantech is a Premier Member of the Intel® Embedded and Communications Alliance, a community of embedded and communications developers and solution providers.